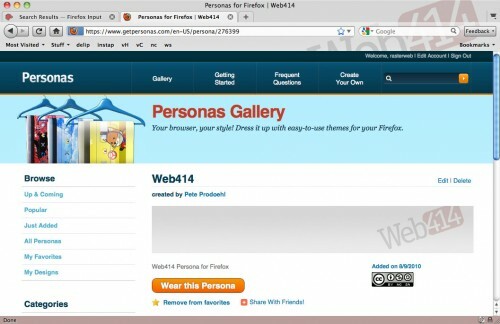 Personas are the easiest way to theme Firefox. Got Firefox? Visit getpersonas.com and it’ll get you started. And for you Web414 fans, you can install the Web414 Persona. If you wanna go “Persona Crazy” you can install Personas Plus for easy access to over 60,000 personas. Posted on Tuesday, August 10th, 2010 at 5:00 am. Subscribe to the comments feed. Both comments and pings are currently closed. Post on your own blog.